Summary: Self-proclaimed fat girl Willowdean Dickson (dubbed “Dumplin’” by her former beauty queen mom) has always been at home in her own skin. Her thoughts on having the ultimate bikini body? Put a bikini on your body. With her all-American beauty best friend, Ellen, by her side, things have always worked . . . until Will takes a job at Harpy’s, the local fast-food joint. There she meets Private School Bo, a hot former jock. Will isn’t surprised to find herself attracted to Bo. But she is surprised when he seems to like her back. My Thoughts: No matter how much praise I give Dumplin, I’ll never do it enough justice. I really loved it a lot. I already read Murphy’s debut, Side Effects May Vary and enjoyed it too. Growing up, I was always normal sized but never really overweight. Once, I got a little older I gained some weight. 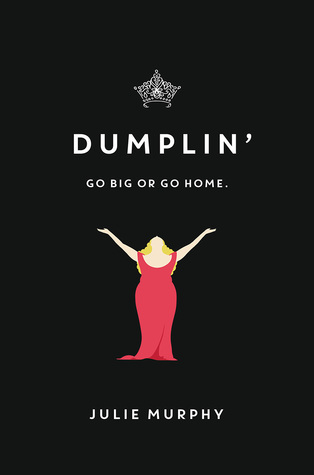 I knew how Dumplin feels. I know the daily struggles she goes through and how she wants to just be herself and she wants others to look at the inside of her, not the outside. We are introduced to Willowdean who is in high school. She works at the local fast food joint alongside a boy named Bo. Oh, Bo. I really loved him a lot. Willowdean and Bo have a sort of secret relationship and this worked for them, at first. It was never outright said it was a secret so when it seemed like he really did want to hide Willowdean, she kind of went the other way for a while. She starts seeing a boy named Mitch. I liked Mitch but I never got the chemistry between Mitch and Willowdean. It just really wasn't there. Willowdean enters a beauty pageant that her mom is involved in. At first, Willowdean does it just to prove a point. That she can. And that she deserves it just as much as anyone else. I really loved all the girls we meet and the things they do with her. I loved the friendships, even the ones that weren’t perfect. I feel like I could just type this review forever but I think this is just one of those books you have to read on your own and experience and one that will keep you up all night long. Overall: I really really loved this one. It made me smile and laugh yet at the same time really made me think about things. It was heartbreaking yet sweet. Add this one to your Fall TBR now! Cover: Love it! It just fits. Cute enough to draw me in but not overly cute where it looks tacky.